Among the major exterior changes on the new Eos: The grille adopts the VW corporate three-bar look, with black slats trimmed with a thin strip of chrome. 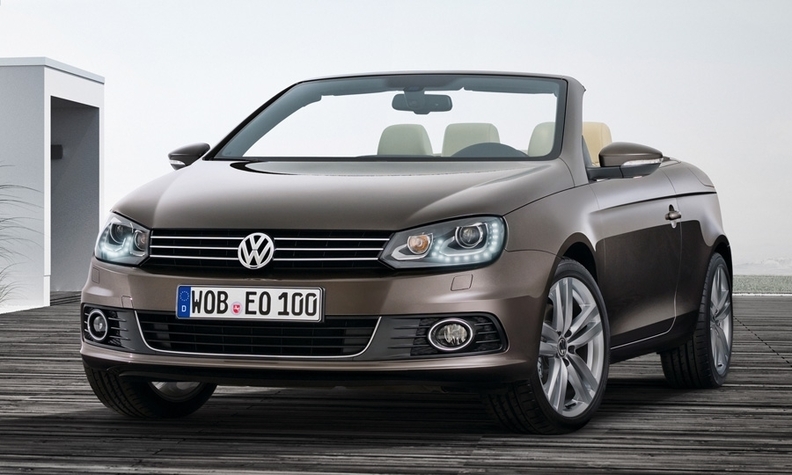 The Volkswagen Eos four-seat convertible is receiving a mild rework for the new model year, with some changes to the front and rear fascias. The six-speed dual-clutch transmission is now standard in the U.S. market. The updated folding hardtop Eos will go on sale in Europe starting in mid-January. The U.S. version goes on sale in late March. Among the major exterior changes: The grille adopts the VW corporate three-bar look, with black slats trimmed with a thin strip of chrome. The headlamps are now framed by light-emitting diodes that function as the daytime running lamps. The taillamps have adopted LEDs as their light source, and the rear fascia has been restyled to incorporate a diffuser. VW said the standard trim on the instrument panel and doors is a chrome with a matte finish. Higher trim levels will continue to include wood accents and leather seating surfaces. The 2012 Eos is also equipped with a keyless lock/unlock and start system. The audio system will receive high-definition radio signals. The sole engine for the U.S. market is a turbocharged, direct-injection 2.0-liter four-cylinder rated at 200 hp. In Europe, three turbocharged gasoline direct-injection engines and a direct-injection turbodiesel will be available. The U.S. is the largest market for the Eos, followed by Europe, VW said.